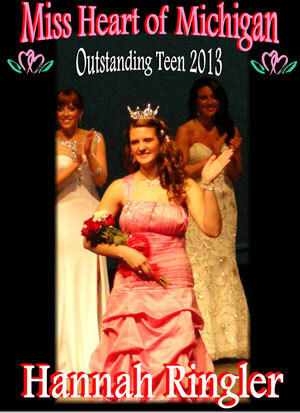 Hannah Ringler, 16 years old and a junior at Cedar Springs High School, daughter of Paul and Jane Ringler, was crowned Miss Heart of Michigan’s Outstanding Teen 2013 in Big Rapids on January 20, 2013. Jane said it was a long but memorable day. The pageant started at 9 a.m., with interviews, and wrapped up at 6 p.m. Each contestant was graded on intelligence, ability to speak, platform issues, resume information, stage presence, talent and health and fitness. Hannah is a vocalist and performed “Over The Rainbow/What a Wonderful World” while playing a ukulele. Hannah has been mentoring youth for several years and is a spokesperson for open adoption. Her platform is “Mentor A Child Today, Improve The World Of Tomorrow.” Jane said Hannah will continue to raise awareness of the importance in mentoring children and what a positive impact mentoring can have on our community. “Every child deserves positive experiences, support and encouragement to help them grow to be happy, healthy and well adjusted adults. Hannah was fortunate to have had several mentors over the years who have helped her become the young woman that she is today,” explained her mother. Hannah plans to also continue speaking on behalf of open adoption and the healthy benefits for adopted children associated with knowing their birth family, medical history and to understand the reasons behind the relinquishment. “So many children could be offered love and support, in addition to what their adoptive family provides, if they were allowed an open adoption,” remarked Jane. “There is never too much love or support to be offered.” She added that Hannah has personal experience with this, being a child who has been allowed an open adoption and knows first hand the advantages. Hannah is looking forward to several events and speaking engagements during her reigning year as Miss Heart of Michigan’s Outstanding Teen, but most of all, she is most excited about all the people that she will have the opportunity to meet and those children’s lives that she may impact. “Hannah feels extremely blessed and her wish is that all children feel good about who they are and confident about where they are going,” said Jane. Way to represent Cedar Springs, Hannah!